Gabriel Orozco: Asterisms at the Deutsche Guggenheim in Berlin is the last exhibition in Deutsche Guggenheim’s commission program. For this show, Mexican-born artist Gabriel Orozco has created sculptural and photographic installations from the rubble he gathered on two sites in New York and in Baja California, Mexico. The objects that are displayed on a platform are detritus that Gabriel Orozco gathered at a playing field in New York City. When picking up a boomerang, he noticed the small pieces of rubbish that were lying on the surface of the playing field: rubber bands, labels, coins, etc. He started to collect and categorize them. Gabriel Orozco gave the work the name Astroturf Constellation, referencing the Astroturf of the playing field on Pier 40 in New York. The second installation is entitled Sandstars. The objects that are spread out on the floor of the Deutsche Guggenheim’s exhibition space come from a protected coastal biosphere and wildlife reserve in Isla Arena, Mexico. This place is also the endpoint of flows of industrial and commercial waste from across the Pacific Ocean: glass bottles, lightbulbs, hard hats, stones, etc. Gabriel Orozco has been there before. From the sands of the wildlife reserve he extracted the whale skeleton that formed the sculpture Mobile Matrix (2006). Sandstars consists of 1,200 objects that now form a monumental sculptural carpet on the gallery floor. The sculptural work is accompanied by large-scale gridded photographs of images of the individual objects. Gabriel Orozco photographed the objects under natural lighting conditions in his studio and then arranged them according to their material, color, size, etc. Gabriel Orozco: Asterisms is the 18th and final project in the Deutsche Guggenheim’s commission program that started in 1997. Among the participating artists of the program are John Baldessari, Hanne Darboven, William Kentridge, Jeff Koons, Gerhard Richter, James Rosenquist, Andreas Slominski, Hiroshi Sugimoto, Bill Viola, Phoebe Washburn, Lawrence Weiner, Jeff Wall, and Rachel Whiteread. More information about the exhibition is also available in the current issue of DB Artmag. Gabriel Orozco: Asterisms. Solo exhibition at Deutsche Guggenheim Berlin. Interview with Joan Young (Director, Curatorial Affairs, Solomon R. Guggenheim Museum). Press preview and opening reception, July 5, 2012. PS: In 2010, the Kunstmuseum Basel presented a major survey of the work of Gabriel Orozco: Gabriel Orozco Retrospective at Kunstmuseum Basel. Click here for the related video. 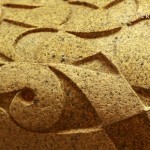 PPS: Click here to see a video including a cover version of Gabriel Orozco’s famous work La D.S. 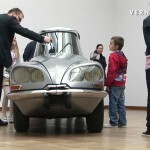 (a sliced silver Citroën DS) by Aleksandra Mir.